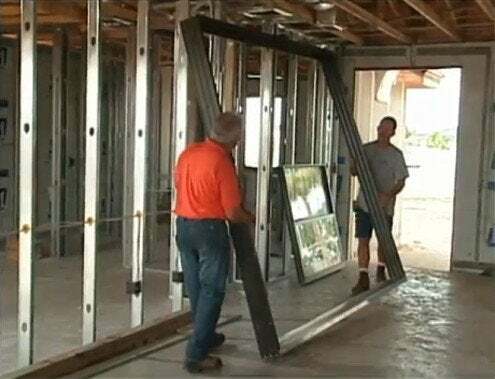 If your next home renovation requires framing new walls, think twice before you reach for those ubiquitous two-by-fours. You might want to consider steel studs. “If your next home renovation requires framing new walls, think twice before you reach for those ubiquitous two-by-fours. You might want to consider steel studs. Because they’re basically just a steel shell, metal studs weigh less and are easier to transport than wood. It’s dimensionally stable: it doesn’t bow or twist like stud lumber can. and you can cut it with tin snips or cut several at once with a carborundum blade on a power saw, saving lots of time and effort on the job. Steel is a great choice if you’re finishing a basement, since it won’t mold, catch fire, or attract insects. Studs twist into place inside the top and bottom channels, making it easy for one person to assemble a frame and screw it together quickly with self-tapping screws, no hammering required. Steel studs are best for interior walls. They do transfer some heat and lower your insulation value. The cost of steel framing fluctuates, but it could wind up costing you half what lumber would, and you can recycle it when the time comes.